Join us on 2015/7/31 regular meeting! Meeting Minute - 2015/07/17 - Officer Report! 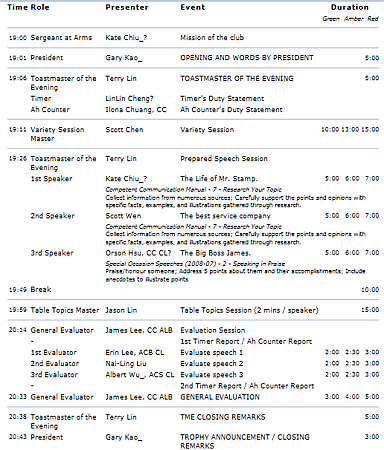 It’s a Big day with many wonderful events for Chungli toastmasters club on July 17th 2015. 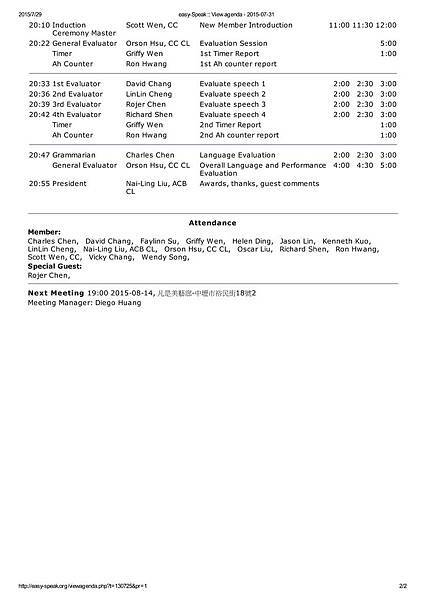 Our TME, Oscar Liu, is so talented because he hosted the meeting very well even this was his first time. The meeting included the interesting variety session: millionaire, professional officer duty reports for the coming year, beautiful previous president, Kate Chiu, delivering a speech as a forever partner, great event-matching table topic questions ---about leadership. We also happily had six guests with us this evening. Apart from that, Ron Hwang and Faylinn Su immediately decided to be our members even before the meeting started. At the beginning, our new and fresh president, Nai-Ling Liu, gave us the moral encouragement, THREE WISHES--- for Chungli Club ---1、We are happy . 2、We are progressing . 3. We enjoy servicing and helping people. YA! This is a supportive and helpful place to enrich your life and make your dream come true. The original meeting on 7/10 will be postponed to next Friday, i.e., 7/17 due to the typhoon vacation. Please do not come on 7/10. Meeting Minute - 2015/06/26 - Regular Meeting! Wow! Summer is coming. Tonight, our meeting theme is Summer Vacation. Our Toastmaster of the Evening tonight is Vichy Chang. A well-prepared TME by introducing all assignment takers with a picture showing what is her/his plan in this summer. Chungli Toastmasters Club has been more than 2 years that never hold a joke session in our meeting. But today, we are different. Eddie holds the joke session to warm (cold?) up tonight. Eddie starts an example of “cold” joke talking about Einstein and Mr. Bean. Then Nai-ling talks about “sleep earlier”. Richard talks about “but”. Kate talks about “tape”. Vicky talks about “ABCDEFG”. Jason talks about “粽葉”. Our welcome guest JT talks about “fluent English”. Don’t be sad if you don’t understand any of above. The only thing you need to do is come to our next meeting. All of them are willing to tell you the joke again. Join us on 2015/07/10 Regular Meeting! You are invited to join the toastmaster meeting on 2015/7/10 (this Friday). The agenda is attached in this mail. The meeting theme of this week is Leadership. Join us on 2015/06/26 Regular Meeting! 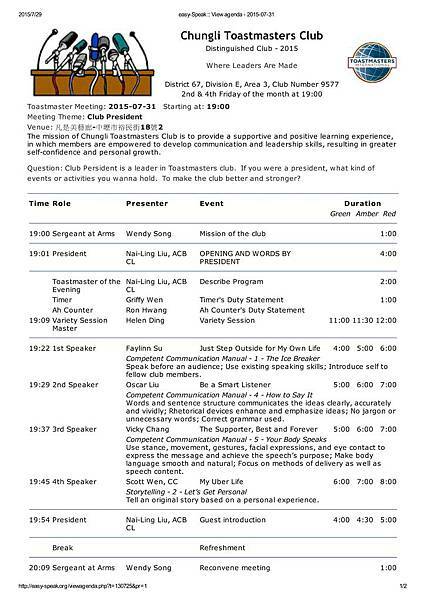 You are invited to join the toastmaster meeting on 2015/6/26 (this Friday). Join us on 2014/08/22 Regular Meeting! After hard working in the weekdays, what is your plan for this Friday night? Want to have an intellectual and relaxed night? 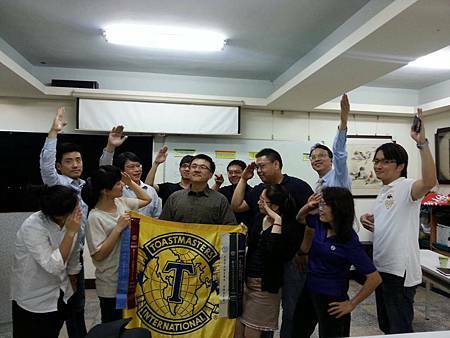 Chungli Toastmasters Club could offer you more than that! The first meeting of 2014-2015 is on July 11th and it's Officer Report Meeting! It was a"starry" meeting, just like the meeting theme "all star meeting". First of all, the meeting was hosted by Terry, his performance of the night was so good that people hardly knew that it was his first time to be Toastmaster of the Evening. He's a rising star of Chungli club. The warm-up session was hosted by Scott Chen, another rising star. He challenged us by playing a spelling bee game, by using pyramid style blanks. In the first round, we must fill-in the pyramid style blanks, in which the last alphabet should be used in the first alphabet of next words. And what more challenge was the second time we must do it backwards, starting from the bottom line of the pyramid. i.e. The last alphabet of the last word should be applied into the upper word. Team B won because, team A was stuck by a word "ironic". Guess which vocabulary ends with "i"? Team A finally got it, I won't tell you the answer, but it's a Japanese food.